Ms. Bissette is a delightfull woman with medium‐length brown hair, green eyes and light facial freckles. Her attire consists of a black button up suit with a white undershirt and a short black business miniskirt and stockings. Her accessories are her blue earrings and watch. Ms. Bissette is a stereotypical French woman, very passionate, be it for teaching, romance, or food. Loves the wine — possibly too much — and "encourages" her students to be the best they can. 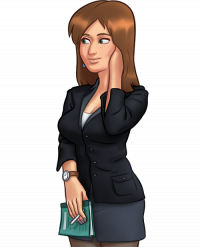 Ms. Bissette is the French teacher at the main character's high school. She makes it clear that she rewards students that do well in her class in unconventional ways. See Ms. Bissette's route for the complete walkthrough. While giving tutoring class, Ms. Bissette tries new teaching methods that are more student‐centred. Finishing her route gives access to her office where he can deepen his knowledge of French. This page was last edited on 13 April 2019, at 20:21.